The County Superintendent of Schools is elected for a four-year term and must hold a current Montana Teaching Certificate with a minimum of three years teaching experience. It is a full-time position in part due to the large number of independent school districts (23) operating in the county. The office includes the superintendent, Jack Eggensperger, an accounting technician, Cheryl Morgan, and an administrative assistant, Marci Knoll. 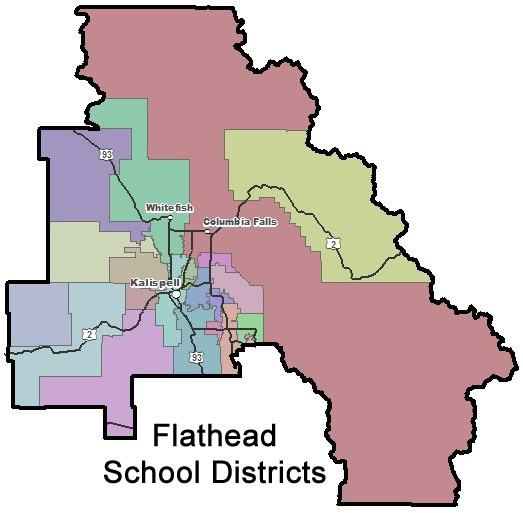 Flathead County communities support twenty-three independent school districts. The nineteen elementary districts have a cumulative enrollment of approximately 9,426 students. The four high school districts - Bigfork, Columbia Falls, Kalispell, Whitefish - enroll approximately 4,257 students. The high schools work in conjunction with Flathead Valley Community College to provide increased local opportunities to students. The elementary districts partner with their respective high school districts to assure "readiness" in transitions. Technology brings the school districts and their accomplishments to public attention through their individual websites. This office encourages visiting the sites. Students in Flathead's schools continue to score above the national average in all curricular areas. Dedicated faculty continue to seek training to guide students through 21st century learning and the digital era. Administrators maintain and direct the motion. The Northwest Montana Educational Cooperative and the Flathead Special Education Cooperative provide excellent services and trainings to the schools. The County Superintendent's Office is proud to be associated with the educational community of this region.